On a cloudy July morning, Jeff and Spencer Tweedy make their way toward 30 Rockerfeller Plaza. In a few hours, the recording project known as Tweedy, featuring Wilco’s frontman and his 18-year-old son, will make their late-night debut on The Tonight Show Starring Jimmy Fallon. They’ll perform two new songs inside a packed studio, and it will be broadcast to nationwide viewers later that evening. Late-night TV performances are a record cycle ritual for Jeff. The 47-year-old songwriter has made more than a dozen appearances on the small screen during his nearly three decades playing with Wilco, Uncle Tupelo, and other projects. It’s Spencer’s first time playing to a televised audience. Spencer, who just received a fresh coat of makeup, sits behind his maple four-piece drum kit as his dad takes his place at center stage. He’s nervous about only having one take to nail the opening drum fill of “Summer Noon” — he started one beat late during soundcheck. He instead nails the part when it counts and relaxes into a steady groove. Spencer describes the past year of his life in a single word: surreal. The Fallon taping was one of many firsts shared with his father. 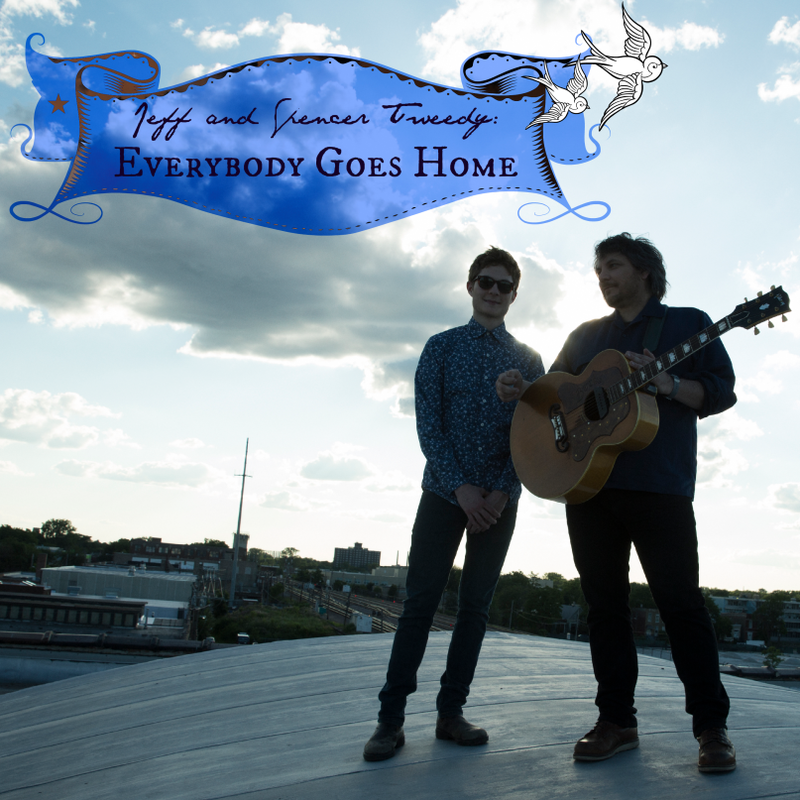 Jeff and Spencer started a band, recorded dozens of songs, and toured across the globe together. The two also posed for press photographs, conducted interviews, and, yes, weathered their share of dad rock jokes. It’s a dream come true by his account. All of those moments arose from the creation of Tweedy’s forthcoming 20-song debut,Sukierae. Like his son, Chicago’s most recognized songwriter managed to tread new ground, albeit in unexpected ways. It’s the closest that Jeff, widely characterized as a private individual and somewhat cryptic lyricist, has come to releasing a proper solo album during his two decades at the helm of Wilco. What initially started as a solo recording session on a rare touring reprieve quickly became grounds for a collaboration with his college-bound son. In the midst of recording, the two were unexpectedly forced to grapple with the most harrowing period in their family’s history, marked by two cancer diagnoses in Jeff’s wife and Spencer’s mom. In the process, Sukierae morphed into a familial affair in the truest sense: a solo record performed by a duo, a father and son creating in the face of uncertainty, and a family finding solace within music amid a passing storm. “I could dedicate every Wilco record to my wife and no one would mind,” Jeff says. “But it feels less personal to me than this situation we found ourselves in. It just coincided in a fortuitous way. I don’t know how it happened … It ended up being more of a family thing. Music has always played an integral role in the Tweedy household. That’s hardly surprising given Jeff’s songwriting career. His wife, Sue Miller, has remained a permanent fixture in Chicago’s music scene that spans from being a co-owner of defunct rock club Lounge Ax, where she first met her husband, to booking all-ages shows for Spencer’s childhood band. Spencer doesn’t remember a time in his life when he didn’t play music with his father. Their musical connection has slowly evolved over the years. During an early Wilco tour, Jeff mailed a drum kit home to his then-two-year-old son. Spencer recalls recording demos on a portable recorder, plus covering Led Zeppelin songs and the Meters’ “Cissy Strut” in jam sessions starting at an early age. Spencer, who formed his rock group the Blisters at the age of seven, has shared the same bill as his father, performing on Lollapalooza’s kid stage three different times (his dad followed one year with a short acoustic set). During the Blisters’ debut gig at Second City, Spencer’s set featured not one but two renditions of his dad’s “Heavy Metal Drummer”. More recently, Jeff invited Spencer to play drums with Wilco on his 13th birthday (“The Late Greats” at Madison Square Garden); started a band with him and Sammy, his younger son (The Racoonists); and let him direct one of Wilco’s music videos (“The Whole Love”). Jeff has long recognized his son’s creative talents — not just when it came to music but photography, writing, and blogging — but says he truly discovered Spencer’s studio chops in the making of Mavis Staples’ 14th record, One True Vine. After working together on her previous full-length, You Are Not Alone, the Chicago soul icon had asked Jeff to work on a follow-up record. Jeff quickly realized the songs needed fuller arrangements and was ready to hire professional musicians. But first, he asked Spencer to lay down a few drum tracks. That initial trial run led to the high school student playing drums throughout the septuagenarian singer’s entire record. One True Vine came at a rare moment for Wilco. The band was entering its 20th year together. Its members were coming off an unexpectedly hectic year of headlining tour dates, plus a series of opening gigs for Bob Dylan. They agreed to take a break for several months — one of the longest in the band’s history — to recharge their batteries and focus on personal projects. Eight years ago, Jeff released his one true solo release: Sunken Treasure: Live in the Pacific Northwest, a DVD and CD featuring select intimate live cuts from his 2006 acoustic tour. He’s remained largely devoted to all things Wilco with the exception of a few side projects, including avant-pop trio Loose Fur and alt-country supergroup Golden Smog, plus producing recent Low and White Denim records. The respite from Wilco allowed Jeff to consider making his proper solo debut. The Wilco Loft is within walking distance of the Tweedy household. When Jeff gets time away from touring, he embraces the rhythm of a daily routine that revolves around the creative space. He approaches any of his latest projects with a workingman’s approach. He’s not only chipped away at Sukierae, but he’s also started toying with some “preliminary Wilco-style demos,” tracking hours of improvised compositions with Wilco drummer Glenn Kotche and lead guitarist Nels Cline and laying the groundwork on potential releases for dBpm Records, which the band started in 2011. Jeff says he’s constantly capturing small musical “snippets” such as verses, choruses, riffs, and melodies onto his phone, in his studio, or with the closest recording device. Those fragments, which continuously pop into his mind during any given project, are then filed away in his personal library. Some grow into Wilco songs, others are eventually used in side projects, and many never materialize into finished tracks. Jeff entered the Sukierae recording sessions with approximately 90 snippets at his disposal. He ended up recording 40 songs, half of which made the final cut for the double album, between the time Spencer had to attend school and complete his homework. Similar to One True Vine, the record afforded him the opportunity to play most of the instruments, including lead guitar, bass, keyboard, and other instruments. (He even performed the electric sitar on “I’ll Sing It”.) Without Wilco’s virtuosic musicians, Jeff was forced out of his comfort zone beyond being a vocalist and rhythm guitarist. He says the heightened pressure to record the bulk of the album’s instrumentation, while writing for himself instead of Staples, gave him newfound license to experiment with his son keeping time by his side. The Tweedys recruited several musical collaborators to help flesh out the album. Laessig and Lucius co-frontwoman Jess Wolfe lent their voices on background harmonies for nearly half of Sukierae’s tracks. After learning ABBA’s “Waterloo” with Wilco for the 2013 Solid Sound Festival, Jeff invited them last winter to the loft and played them dozens of unfinished songs at various stages of completion. Laessig and Wolfe worked long hours with the Tweedys, battling through lost voices, to record countless parts ranging from the soulful harmonies of “Low Key” to the subtler, ethereal layers heard on “High as Hello” and “Where My Love”. McCaughey, who has known Jeff dating back to his time in Uncle Tupelo, heard some of Jeff’s new solo material back in December during a string of solo dates together. The two musicians have a tradition of playing each other new music whenever they cross paths. Jeff invited him to the studio multiple times last spring in what was originally an unspecified role. McCaughey says he contributed the occasional piano and vibraphone part, but mostly just hung out and offered his personal thoughts to his close friend. Sukierae started with a title based on Sue’s childhood nickname. “She wanted people to think her name was Sukie,” Jeff says. “Like Peter Noone of Herman’s Hermits sister.” The name of the record, however, only touches the surface of her influence on the duo. In the midst of the Sukierae sessions, doctors diagnosed her with two rare forms of cancer. That stunning discovery changed the course of the recording process. According to Jeff, one tumor was found in her chest in the same spot where a cancerous growth was removed nearly a quarter century ago. Doctors also discovered that Sue had bone lymphoma. For months, the Tweedy family hung in the balance about how serious the diagnoses would be — a time that Jeff refers to as the “hardest period in our family’s history.” The uncertainty in turn left an indelible mark on the record. Spencer says he felt “pulled in two drastic directions” between the best and worst experiences of his life. For Jeff, Sukierae became a coping mechanism that offered refuge from the anxiety caused by an arduous and lengthy diagnosis process. Jeff and Spencer received word about Sue’s growths toward the end of recordingSukierae. Doctors later informed Sue that both forms of cancer were treatable. The shocking news eventually led Jeff to pen personal lyrics focusing on broader themes of life and mortality. His songs touch upon nostalgic memories of watching Judy Garland movies with his mother (“I’ll Never Know”) and reflect on the passing of his older brother, a railroad man from southern Illinois who suffered from the failure of his heart and kidney last summer (“Nobody Dies Anymore”). Sue, who has received several rounds of chemotherapy treatment, is on the road to recovery. Given his wife’s sickness, Jeff muses about ideas of love, permanence, and perseverance throughout the course of Sukierae. Some songs were written before that diagnosis, but the entire record carries the added weight of that hardship. In response, Jeff says the record became a coping mechanism during the tumultuous period. Sukierae enabled Jeff to “disappear into the music” they were making. It also allowed him to acknowledge the importance of his wife. His wife is only directly mentioned in the record’s title. But he wistfully croons about growing old with a significant other on the melancholic piano ballad “Where My Love”. On “Wait for Love” and “New Moon”, he sings about the patience and devotion needed in a committed relationship. It’s hard to imagine Jeff writing these songs for anyone else. In a period of near-tragedy, he did so with greater clarity than ever before. Jeff Tweedy isn’t a crowd-pleaser in the conventional sense. He’s never been that kind of songwriter. He’ll likely never be one. He thrives on the uncertainty that comes with challenging his fans during shows. He has no problem denying fan song requests, squabbling with concertgoers if they cross him, and changing up his setlist on the fly. That confrontational streak typically happens during Wilco shows, but it can become even more defiant outside his longtime group. In early June, Jeff continued that uncompromising tradition during Tweedy’s debut show at the Masonic Temple in Detroit. Playing to a 4,400-person room, they kicked off the set with 14 new songs from Sukierae that the vast majority of attendees had never heard before. Yes, you read that right: 14. “[It was] a colossally ignorant thing to do,” Jeff quipped during the set, before conceding to a solo set filled with Wilco classics and deep cuts from Uncle Tupelo, Loose Fur, and his collaboration with Staples. But the unprecedented setlist choice, though unplanned, exemplified Jeff in his element. Since the Detroit performance, Tweedy has toured in short stretches that have partially revolved around Sue’s treatment cycles. The project’s touring outfit includes bassist Darin Gray and guitarist Jim Elkington, two of Jeff’s friends, and keyboardist Liam Cunningham, Spencer’s pal since grade school. Spencer’s elder collaborators regularly describe him as mature beyond his years, despite the age difference. Jeff characterizes his son as “serious and level-headed” on tour. “Spencer is the oldest soul,” Wolfe adds. Tweedy’s dynamic gives off the impression that the group is a low-key, low-stakes affair. But that couldn’t be further from the truth. Sukierae proved to be a fortuitous gift that offered Spencer a life-changing experience amid a chaotic year. It also helped Jeff, who decided to resume his medication for anxiety and migraines, be in a better state of mind to support his wife in her time of need. If anything, Tweedy transcended the original plans for a laid-back father-and-son collaboration given the hardship their family endured. Sukierae will be the duo’s last major effort for the foreseeable future. Jeff doesn’t hesitate to say that he would make another record with his son. But after taking a year off following high school, Spencer plans to attend a small liberal arts school in Wisconsin next year. He wants to keep his options open about a major — maybe literature — but doesn’t see himself studying music at college. Jeff says being there for Sue’s full recovery will take precedence in the coming months. She’s expected to be in complete remission after a couple more treatment cycles, doctors say. His touring and recording will revolve around her schedule at least through the year’s end. He’ll return back to those “Wilco-style” demos at some point. And he’ll have his usual smattering of musical projects. The songwriter has his eyes peeled for his next big challenge: one that motivates, inspires, and makes him feels like something’s on the line. That’s when he’s at his best, he says. He doesn’t know what that’ll be. But he’s in search of what lies ahead.